In the absence of arterial compromise, the treatment of symptomatic deep vein thrombosis (DVT) has long plagued clinicians. The mainstay of chronic therapy— anticoagulation—prevents clot propagation and recurrent thrombosis but offers little acute relief to patients with painful DVT and has low success rates in forestalling post-phlebitic syndrome. The alternative, thrombolysis, carries its own risks, including major bleeding and increased initial costs, but may be an important option in select patients and offer downstream economic benefits. Post-phlebitic (post-thrombotic; PPS) syndrome affects up to 20-50% of patients within two years after a DVT, despite adequate medical therapy (1). Patients experience lifestyle-limiting pain, edema, venous ectasia, hyperpigmentation, and venous ulceration; severity is typically assessed using the Villalta score, which tallies 5 symptoms and 7 clinical signs into a cumulative point total (with >15 points being severe). Thrombus removal may reduce rates of PPS by eliminating residual thrombus and improving vascular function. Options include operative thrombectomy or catheter-directed thrombolysis, either of which may be coupled with treatment of associated vascular stenosis or insufficiency with stenting or bypass. 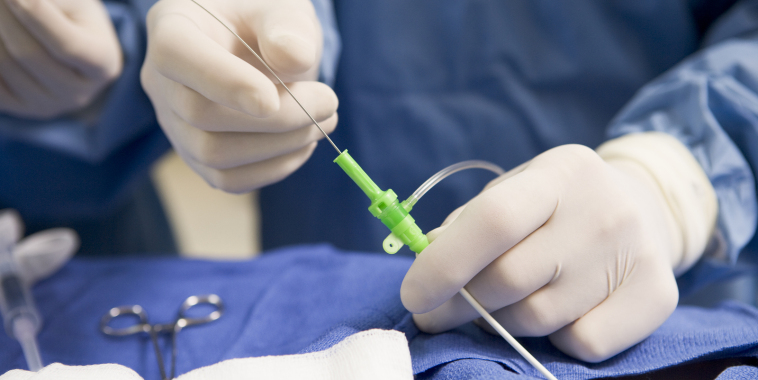 Catheter directed infusion improves drug delivery directly within the thrombus, and may be done with or without mechanical thrombectomy utilizing high-powered irrigation / rheolysis (e.g., AngioJet©, MEDRAD, PA, USA), catheter osscilation / rotation (e.g., Trellis, Covidien, MA, USA), or ultrasound enhancement (e.g., EKOS, EKOS Corporation, WA, USA). Important evidence on the effectiveness of catheter-directed lysis will come from the ongoing Acute Venous Thrombosis: Thrombus Removal With Adjunctive Catheter-Directed Thrombolysis trial (ATTRACT; NCT00790335). (9) The trial plans to enroll 692 patients with symptomatic proximal DVT involving the iliac, common femoral, and/or femoral vein. Participants will be randomized to anticoagulation (control) versus anticoagulation plus intrathrombus delivery of recombinant tissue plasminogen activator (rt-PA) using one of three platforms: (a) Trellis-8 Peripheral Infusion System; (b) AngioJet Rheolytic Thrombectomy System; (c) Multisidehole infusion catheter. Anticoagulation will be initiated with heparin, enoxaparin, dalteparin, or tinzaparin followed by long-term warfarin (INR 2.0-3.0). 2) Douketis JD, Crowther MA, Foster GA, Ginsberg JS. Does the location of thrombosis determine the risk of disease recurrence in patients with proximal deep vein thrombosis? Am J Med. 2001; 110:515-519. 3) P. Prandoni, A.W. Lensing, M.H. Prins, et al. Below-knee elastic compression stockings to prevent the post-thrombotic syndrome: a randomized, controlled trial. Ann Intern Med. 2004; 141: 249–256. 4) Comerota AJ, Throm RC, Mathias SD, Haughton S, Mewissen M. Catheter-directed thrombolysis for iliofemoral deep venous thrombosis improves health-related quality of life. J Vasc Surg. 2000 Jul;32(1):130-7. 5) Grewal NK, Martinez JT, Andrews L, Comerota AJ. Quantity of clot lysed after catheter-directed thrombolysis for iliofemoral deep venous thrombosis correlates with postthrombotic morbidity. J Vasc Surg. 2010 May;51(5):1209-14. 7) Kim HS, Patra A, Paxton BE, Khan J, Streiff MB. Catheter-directed thrombolysis with percutaneous rheolytic thrombectomy versus thrombolysis alone in upper and lower extremity deep vein thrombosis. Cardiovasc Intervent Radiol. 2006; 29: 1003-7. 8) Bashir R, Zack C, Zhao H, Comerota, A, Bove, A. Comparative outcomes of catheter-directed thrombolysis plus anticoagulation vs anticoagulation alone to treate lower-extremity proximal deep vein thrombosis. JAMA Intern Med. 2014; 174: 1494-1501. 9) Enden T, Haig Y, Kløw NE, Slagsvold CE, Sandvik L, Ghanima W, Hafsahl G, Holme PA, Holmen LO, Njaastad AM, Sandbæk G, Sandset PM; CaVenT Study Group. Long-term outcome after additional catheter-directed thrombolysis versus standard treatment for acute iliofemoral deep vein thrombosis (the CaVenT study): a randomised controlled trial. Lancet. 2012;379:31-8. 10) Watson L, Broderick C, Armon MP. Thrombolysis for acute deep vein thrombosis. Cochrane Database Syst Rev. 2014; 1:CD002783. doi: 10.1002/14651858.CD002783.pub3. 11) Comerota AJ. The ATTRACT trial: rationale for early intervention for iliofemoral DVT. Perspect Vasc Surg Endovasc Ther. 2009; 21: 221-4.